This was actually extremely easy to do. What is it supposed to do & Did it work? 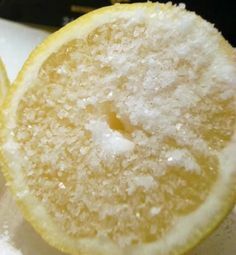 Lemon is supposed to tighten the pores and even out skin tone, sugar removes dead skin cells and cleans pores, and honey is said to help prevents future breakouts. On day one, I noticed results immediately. The blackheads around my nose were noticeably reduced, my pores around my nose were also smaller, and my skin was smoother. By day two, my blackheads were gone! I also put a little sugar in a bowl and kept it by my sink. I got my hands damp and put a little sugar in them and scrubbed my face and hands. Two days later, my hands are still amazingly soft! This isn’t something I would recommend to do to your face every night, however, once or twice a week would be a great addition to your beauty routine! I know it will be in mine! Leave a comment below if you give this a try, I would love to hear how it works for you! This entry was posted in Beauty Tips and tagged all natural face masks, beauty, beauty tips, beauty tips tuesday, Detroit, detroit vendor, detroit wedding planners, detroit wedding planning, facial uses for lemon, health, lemon honey sugar face scrub, michigan, ohio, serendipity weddings and events, wellness. Bookmark the permalink.